This is a dish to gather family around. This hearty comfort food is perfect for a warm night in. Fresh herbs and the crispy peaks of the potatoes elevate this simple dish to a gourmet status. This dish is dairy-free, gluten-free, and absolutely delicious. A perfect comfort food to gather the family around. Prep the ingredients for the mince during the down time while the potatoes are cooking. Boil a pot of water, and add the potatoes. Simmer the chicken broth with garlic and reduce the broth by half. Once the potatoes have softened, strain them. Add the potatoes, reduced chicken broth (with garlic), egg yolks, and thyme to a bowl and mash everything together. Add salt and pepper to taste. 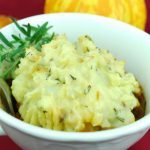 Keep the potatoes warm as you prepare the mince. Heat the olive oil in a large pan. Add the ground meat, and break up the meat into very small pieces. Once the meat is evenly browned add the rosemary, thyme, and garlic. Once the herbs and garlic have been evenly distributed add the onion and carrot. Mix everything until it has an even consistency. Thoroughly mix in each individual ingredient before adding the next in the following order: First Worcestershire sauce, then tomato. Add the red wine, and sweat down the liquid for 1-2 minutes. Add the frozen peas, and cook till heated. Season with salt and pepper to taste. Pour mince mixture to a large oven proof pan. Spread mashed potatoes over the top. Fork potatoes to form sharp peaks. Bake at 350 for 15-20 minutes or until the potatoes turn golden brown. This dish can also be made in single serve dishes, as shown.